Comments: A difficult but rewarding proof variety to locate. First, the base of the 2 digit is mistakenly punched into the rock directly below the pendant. Secondly, the 7 and 2 digits have been repunched. 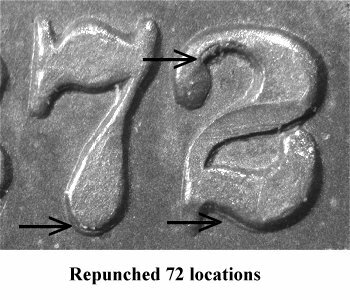 Repunching is visible at the bottom of both digits. In addition, the 2 digit shows repunching within its upper loop. Please see the photographs. 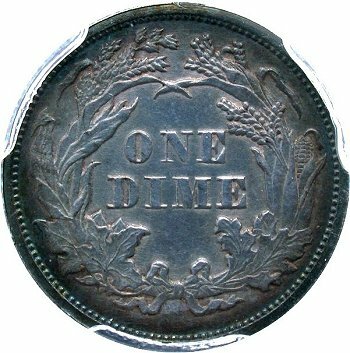 Minor die doubling is seen on the outside of the wreath leaves directly to the left of ONE DIME. 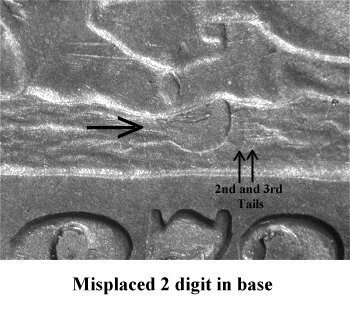 During August 2008, Dan Pintar identified second and third "tails" of the misplaced 2 digit immediately to the right of the misplaced 2. 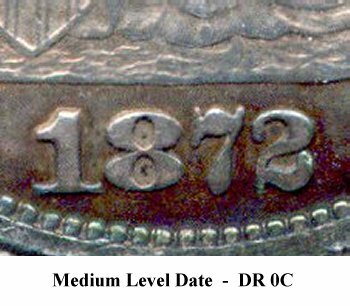 A close inspection of the macro image on this page does show the shadows of the second and third "tails" of the 2 digit. The variety was discovered by Kam Ahwash and first listed by Greer. It is further listed as part of the Top 100 Varieties set. 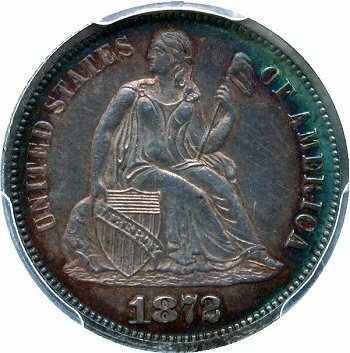 An example of this variety, grading PCGS PF65 Cameo, brought $2760 at the Heritage Central States Signature auction during May 2004.